An effort to train the women of Kalahandi region, associated with starvation deaths, in fabric making could change the profile of the district. Bibhuti Mishra reports. Coming from the land of death, drought and child sale, it sounds like a fairy tale. However, it is true. Poor tribal women of Kalahandi are weaving a success story for themselves. In addition, what is even more gratifying is that educated urban women are lending them a hand. Gayatri Iyer, a suburban Mumbai middle-class singer, has suddenly been catapulted to international fame. Gayatri obtained her MBA at the Indian Institute of Management, Lucknow, and decided to forgo the fabulous corporate job opportunities offered through campus interviews to pursue a singing career. The legal quibbles regarding the marriage of Prince Charles the Prince of Wales and Mrs Camilla Bowles may continue. But, the well wishers of Prince Charles—the dabbawalas of Bombay have bought a marriage present, a half-paithani saree, a pair of the fabulous Kolhapuri sandals and a ceremonious maratha head gear for him. Once upon a time, there was a coquettish, little princess of a girl and a prince, for whom she became the object of desire. They married, had two children, and the little princess excelled in her capacity to be adored. Coming from the land of death, drought and child sale, it sounds like a fairy tale. However, it is true. Poor tribal women of Kalahandi are weaving a success story for themselves. In addition, what is even more gratifying is that educated urban women are lending them a hand. Life seemed to be an unending nightmare for Chhamani Majhi. Along with an ailing husband and old in-laws, she seemed to be heading for a starvation death, the inevitable destiny of most women like her in Kalahandi. But then ‘Nuakala’ happened to her. She was employed for spinning and in the very first month, she earned Rs 800. With that, she brought baby food for her daughter, a lantern to light her hut and clothes for her husband and in-laws. Life has taken a new dimension and seems meaningful. Kunti Majhi would have left Kalahandi in search of work and perhaps ended up as a bonded labourer somewhere. Then ‘Nuakala’ came to her village and she was ‘employed’ in weaving handloom fabric. Right in her village she is earning more than Rs.750 per month and is able to provide two square meals a day to her family. Rukmini Majhi’s family life is more balanced today. Her husband is off country liquor and her children get food and education. She is a supervisor at a ‘Nuakala’ spinning centre in her village. All these women from the Gond tribe in Kalahandi have left poverty and privation behind because of the handmade cotton ‘Nuakala’ garments produced by them, thanks to Kalahandi Vikash Parishad which has been working among the tribals of Kalahandi and Nuapada districts. Watershed management, relief work and a sustainable employment generation programme have been on the agenda. The collective effort is spearheaded by Amitav Banerjee, a marine engineer. He worked with MNCs and was based in Kolkata. He resigned his cushy job to pursue his goals in Kalahandi fulltime. Says Banerjee, "There was a substantial area of black cotton soil; suitable for cotton cultivation for which the water requirement is almost 20 times less as compared to paddy cultivation. Crop failure and resultant poverty could be avoided if cotton cultivation was promoted. "Banerjee got to work with social activist Rabi Das of KVP. 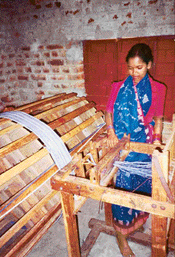 Six villages were adopted and continuous spinning, processing and weaving work undertaken. Only in dyeing and bleaching men are engaged, spinning and weaving have become women’s preserve. Says Rabi Das, who has been working in Kalahandi for two decades, "It has made a tremendous difference to family life, with women becoming bread-earners. In fact, women are very sincere and good workers while men drop out and are not very persevering." This module is worker friendly too. Women follow a flexible timing. "We could not have done the job had there been strict timings because we have family responsibilities too. We come in the morning, then go back, cook food, take care of other chores and again come back to the centre in the afternoon and work till nightfall. If we work for six hours, we are able to earn Rs.25 to 30 per day," reveals Chhabina Majhi of Bilenjar village where there is a central weaving centre. 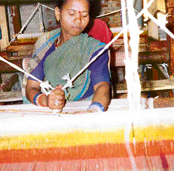 There are 30 looms in villages like Sunbaheli, Chatta, Jampada, Malpada, Malikimunda and Bilenjar. More than 100 tribal women have been earning their living. Banerjee is very happy. Says he, "I am very impressed with their work culture.These women are really hardworking and committed. They can change the face of Kalahandi, if they are provided with the right opportunity." Self help through community participation’ has also caught on. Committed to self-help the tribal women of Malpada village offered free labour to set up a work centre in less than two months on land donated by local tribals. Now 12 women work at the centre and support their families. A sliver plant could ensure massive expansion of this project and bring down the rate of raw materials thus generating more income for the tribal women who could also be engaged in larger numbers. But the plant costs more than Rs 80 lakh. A project has been lying with the Planning Commission but has found no takers. People involved with this noble cause are undeterred. ‘Nuakala’ (taking its name from ‘Nuapada’ and ‘Kalahandi’) garments and cotton fabrics have found champions in many city-bred women who have come forward to join hands with their tribal sisters to promote empowerment through self-employment. There are many doctors, professors and high-profile activists who are endorsing the cause of ‘Nuakala.’ Says Gayatri Das of Cuttack, wife of celebrity cardiologist J. P Das who is also involved with the project garments are prepared keeping in mind the latest trends and fashion. We have to reach out to all sections through exhibitions, retail counters and fashion shows in big cities and metros." Nivedita Scudder, a high-profile social activist, says "We are determined to make our brand name ‘Nuakala’ as popular as ‘Fabindia’ which is not pure khadi but is still very much in demand. Designers are roped in and there is a constant attempt at improving the look and design." It is empowerment of Kalahandi that could feature in the news, now for the right reasons. Gayatri Iyer, a suburban Mumbai middle-class singer, has suddenly been catapulted to international fame. Gayatri obtained her MBA at the Indian Institute of Management, Lucknow, and decided to forgo the fabulous corporate job opportunities offered through campus interviews to pursue a singing career. "My mother took tuitions all week – even Sundays – to support my studies," she says, "But when I decided to refuse highly-paid corporate jobs to seek an uncertain singing career, she supported me completely." Last year, Gayatri married upcoming playback singer Kunal Ganjawala, who won the Filmfare Award for the hit song Bheege Hont Tere in Murder. 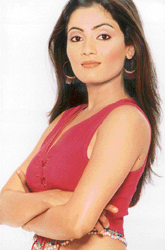 Before marriage, she sang hundreds of jingles and became a promising playback singer working with Ranjit Barot, Ram Sampath, Himesh Reshammiya, Anand Raj Anand and Shankar-Ehsaan-Loy. Till now, her greatest success has been singing for Gurinder Chadha’s Bride & Prejudice. This month, the bubbly girl from Mumbai’s nameless middle class became an overnight international star-celebrity when she was chosen for the lead role of Princess Anjuli in the prestigious international musical based on M.M. Kaye’s Raj-novel Far Pavilions, to be presented in London’s West End, after the huge success of Andrew Lloyd Weber’s Bombay Dreams, with music by A. R. Rahman. "I went to the auditions in Mumbai with a friend to give her support," Gayatri says, "But I was persuaded to give an audition myself for a lark. I never thought I would win. Now I am in London for fittings of costumes that I will wear in the international stage production. Rehearsals will begin in spring. Far Pavilions is the story of a romance between an Indian princess and a British officer during colonial rule. It is a challenging role for me apart from singing under the direction of internationally known music directors. The entire cast will be chosen from many countries. Working in the grand production is going to be a memorable experience for me. Her husband Kunal encourages Gayatri by saying that she deserve this success completely. The legal quibbles regarding the marriage of Prince Charles the Prince of Wales and Mrs Camilla Bowles may continue. But, the well wishers of Prince Charles—the dabbawalas of Bombay have bought a marriage present, a half-paithani saree, a pair of the fabulous Kolhapuri sandals and a ceremonious maratha head gear for him. The whole episode started with the visit of Prince Charles in 2004 to India. He had read about the food being supplied to the Bombay office goers by the organisation known as Dabbawalas and had heard that their efficiency is better than many top grade world firms. According to Forbes magazine, which conducted a study of the 5000 dabbawalas, they do not make even one mistake in the millions of deliveries they make every year to the 2,00,000 office-goers. They collect the food at 9 am and ensure that the empty tiffin box is back at the office-goers’ home by 5 pm. All for Rs 300 a month. Prince Charles met them in Bombay and quizzed them about their work and got them world publicity. This year when the dabbawalas heard of the marriage of their British patron, they decided that they must do their best to him and his consort. What can be more important than a fabulous paithani saree for the bride? It is a fact that very few Indian brides can afford a paithani sari. Paithan today is a simple taluka town in Aurangabad district. A quiet religious place on the northern banks of Godavari in Maharashtra. Gone are the days when Paithan was a prosperous trade centre called Pratisthan and exported rich fabrics and precious stones to far off lands. Paithani is a poem in silk and gold. 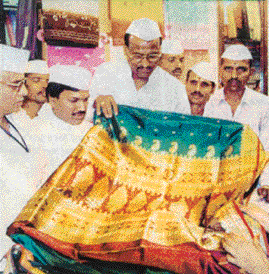 The art of weaving paithani saris in Aurangabad is believed to be 2,000 years old. The border and the reversible pallav are the defining features of an original Paithani saree and is reversible with the same design seen on both sides. A paithani can retain its texture for at least 200 years. In the Pune Purwar museum, there is a paithani saree reputed to be 800 years old. The mulberry silk to make sarees comes from Bangalore and costs about Rs 1,700 per kg, while the zari is moved in from Surat at Rs 800 to Rs 12,000 per kg. On an average, a paithani saree has 200 to 350 gm of zari, 700 gm of silk and a completed saree weighs between 800 and 900 gm. Traditional creative artistry and painstaking workmanship combine to form this unique cloth and make it an experience for the visual and tactile senses. It takes a master weaver an entire day to weave just an inch of this material and sometimes a saree is completed after a year-and-half. Paithani sarees are expensive, they come for anything between Rs 4000 and Rs 2.25 lakh. The price depends not on the material, but on the workmanship. The great 13th century traveller Marco Polo once wrote of this fabric that was given to him in the Deccan region, "it is as fine as spider’s web and kings and queens of any country will take pride in wearing it." The art of weaving these sarees almost died down but for the effort of a Qureshi family from Aurangabad to revive it, 100 years ago during the time of Nizam of Hyderabad. The Qureshis preserved and promoted the art. The 13th generation of that famous family, Ajas Ahmed Quereshi, today runs the Aurangabad Paithani Weaving and Training centre in Aurangabad. This is a government undertaking. The government sponsors the looms for the work and runs training schemes for people interested in the art of weaving. Ajas Quereshi, who learnt the job from his father, is a master craftsman himself and specialises in the weaving and designing. One can go to his 150 year-old factory, where the original treasure of paithani art is preserved. It is open between 7.30 am and 10 pm every day. In the factory, you will see master craftsmen in action on a double-sided loom painstakingly working on a saree or shawl. One will be a programmer, who makes the design and the other, the weaver. I Designs are adopted from the frescoes of Ajanta or from traditional Mughal motifs. People come from all over India to buy Paithani sarees at this factory. The labour force consists of 150 women and on an average each worker earns between Rs 200 and Rs 500 per month depending on the type of paithani sarees she weaves. Another important centre for the production of his type of sari is the Paithani Design and Demonstration centre run by the Maharastra Government, about 60 km from Aurangabad. Even till quite recently the rich used to place orders for a paithani saree costing about Rs 2 lakh a piece and taking about two years to weave. Nowadays the price range has fallen to about Rs 30,000 per piece. And Camilla Bowles, who has almost become the Queen of England, will be having a semi-paithani saree in her wardrobe. Once upon a time, there was a coquettish, little princess of a girl and a prince, for whom she became the object of desire. They married, had two children, and the little princess excelled in her capacity to be adored. One day, everything felt out of joint. Her children were growing up and no longer willing to shower her with adoration, and her one-time prince now responded with irritation. The little princess was filled with a terrible insecurity. She sank into a depression; she flew into rages. Then one terrible day, her world fell apart. Her prince found another princess. Her castle became a prison and trap. At the heart of this story rests one of the most frequent wounds brought by women to therapy. Learned by many girls early on, it is the wound of narcissistic naivety. Needy of being loved, it’s as if an unspoken agreement happens early on in the lives of many women, in which they unconsciously agree to hand over their power to men, in return for feeling adored. "If I promise to make you feel strong and powerful by staying weak and helpless," the unconscious message goes, "will you, in return, promise to adore me and so make me feel secure?" Often, such women are "daddy’s girls" - daughters who learnt coquettish helplessness very early on. Sadly, it is often not until the castle has come tumbling down that I get to meet such women in therapy. The fairy tale is over, the prince has gone, and the emptiness that has entered their lives is poignant. "What did I do to deserve this?" asked one woman. "I gave him so much for so many years." In this woman’s case, what she did do unwittingly for so many years was remain naive and undeveloped. It is the hardest thing of all to take some responsibility for the way things are, especially when grief and rage are dominant. It was about a year down the therapeutic road that she was able to accept her own part in the way things had fallen out. Her unconscious literally gave her a helping hand in the form of a dream: "I am back in my old childhood house, and although I am myself as I am now, I am also a little girl of about 10. There is a knock at my door, and when I open it a boy is there, a bit unkempt. He holds out his hand for me to take, and I realise I need to go on a journey with him." Psyche never ceases to amaze me. Its capacity to show us who we are is ceaseless. So, who was the neglected and unkempt boy in her dream? Images of young boys are frequent in women’s dreams. For Jung, they are expressions of the animus, the inner and undeveloped masculine in a woman. If listened to and acted upon, such images can facilitate the integration of positive masculine qualities that have lain dormant. Came herpart in the deterioration. "Looking back, I had the helpless-little-girl role down to a fine art, very much as my mother had, and could wrap everyone round my little finger with it. Until they got fed up." For this woman, exploration and integration of her own power and curiosity lead, at long last, to a loosening of dependence upon the outside world to dish out her emotional needs. This gradual discovery of her own untapped strength was a strong silver lining to the cloud of her marriage having tumbled down.